Startup items are programs that typically launch at the operating system startup, which are installed along with the application. These often include the system tray icons that permit direct access to the functions of the application, even when the application is not running. You can configure the fonts used in your package by choosing the Startup tab in the project dashboard. The operating system launches startup items as either as a special registry key called run keys or as a Start item. You can set your launch preference in Virtualization of the Settings dialog box. The path to the executable in a run key is displayed in the Startup tab. Applies to the current user. Applies to the current user but only runs once. Applies to all Amazon WorkSpaces. In the Startup tab, open the context (right-click) menu for either the HKCU or HKLM folder in the left navigation pane and choose Add Startup Value. In the Add Startup Value dialog box, enter the name and path to the executable file of the startup item, and choose OK. 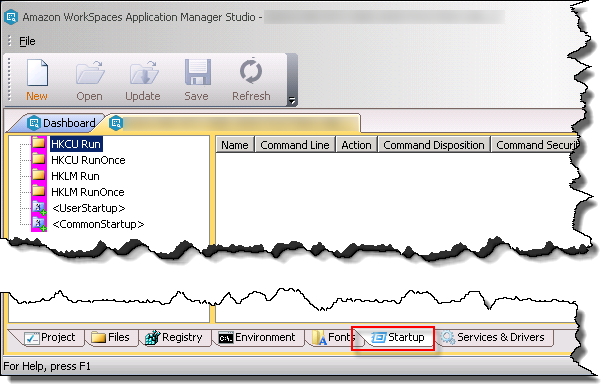 In the Startup tab, open the context (right-click) menu for either the <UserStartup> or <CommonStartup> folder in the left navigation pane and choose Add Startup File. In the Add Startup File dialog box, enter the name and path to the executable file of the startup item. To use a different name for the executable file, choose Override source file name with the following name and enter the new name. In the Startup tab, open the context (right-click) menu for the font that you want to edit, and choose Edit. In the dialog box, change the values and choose OK. If the disposition of the registry key for a startup item is Installed-permanent (layer 1) or Installed-temporary (layer 2), but the corresponding executable file disposition is set to Virtual-integrated (layer 3) or Virtual-isolated (layer 4), the item is flagged with the disposition in red, because the registry key is physically present on the client, while the file to which it points is not. You can edit the prefetch, disposition, and security settings from Startup tab, instead of finding and editing the font file in Files tab. In the Startup tab, open the context (right-click) menu for the font that you want to edit, and choose Edit Command Line File Properties. In the Command Line File Properties dialog box, change the property values, and choose OK. If a startup item points to a shortcut (.lnk file) which has a Installed-permanent (layer 1) or Installed-temporary (layer 2) disposition, but the target executable file is set to Virtual-integrated (layer 3) or Virtual-isolated (layer 4), the item is flagged with the disposition in red, because the shortcut is physically present in the operating system, while the file to which it points is not. In the Startup tab, open the context (right-click) menu for the font that you want to delete, choose Delete, and choose OK.
Startup items that are excluded are not used in Amazon WorkSpaces, but are still part of the package. This gives you the flexibility of including specific startup items in one package deployment and not in another package. Excluding startup items also enables you to test an package without a startup item before removing the startup from the package. In the Startup tab, open the context (right-click) menu for the font that you want to exclude, and then choose Exclude.